In consequence of short-circuiting, the feed prematurely reaches the effluent and the underflow. Short-circuiting into the underflow (sludge). While "effluent short-circuiting" is reasonably well described and treated in most final clarifiers, "underflow short-circuiting" is frequently not correctly understood, described and controlled. The advantage of this approach is that z can be calculated from routinely measured concentrations Xr and Xa. The bottom sludge concentration can be easily measured. and Qsc is the short-circuiting flow. Though Günthert claimed that equation 12 is valid from R 0.15 to 1.83, the values of Qsc/Q0 are negative below R approx. 0.22 and greater than 1 above R = 1.4. In his field measurements at several plants, the clarifier Buchloe II produced typically Xr ~ 6 g/l and Xb ~ 13 g/l. It has to be noted that the bottom concentration would double the recycled concentration at a poorly designed clarifier only. It has been found that new clarifiers at the treatment plant in Prague (diameter 44 m) reveal Xr/Xb > 0.9, indicating very small z (about 0.1). 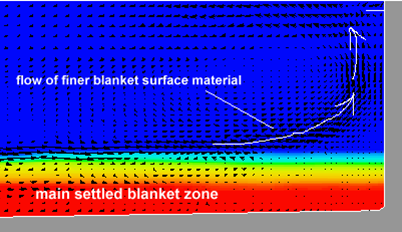 The smaller z, the shallower the sludge blanket and the higher the limiting load. German guideline A131 recommends to calculate the sludge blanket height from the bottom concentration but fails to offer methodology how to calculate the bottom concentration. Instead, it recommends to use Xr ~ 0.7Xb (or 0.5-0.7), regardless of R. Interpretation in relation to short circuiting is shown in the figure. It can be seen from the figure that the main discrepancies are at low recycle ratios. Günthert's prediction is too low, that of A131 too high. Excessive sludge recycling is contra productive, while too small recycling requires high degree of activated sludge thickening. Optimum conditions are achieved by a correct algorithm of the recycle flow control. 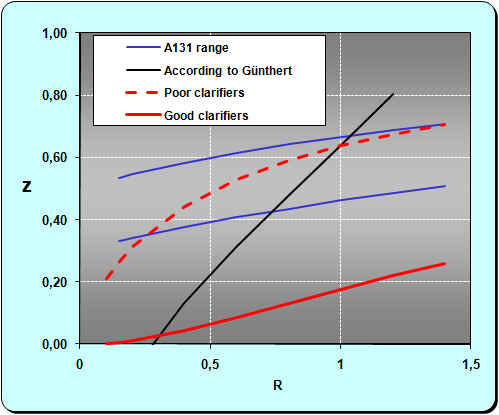 Correctly designed and operated up-to-date clarifiers are significantly better than those presumed by A 131.